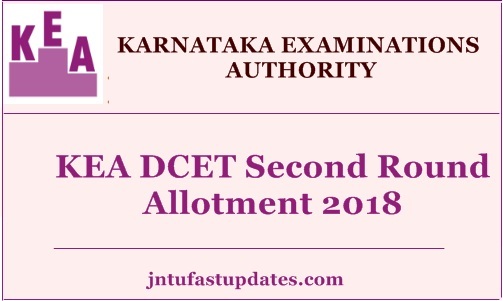 Karnataka DCET Second/2nd Round Allotment Results 2018: Karnataka Examination Authority (KEA) has today (20th September) declares the DCET Second Round allotment result on its official portal, kea.kar.nic.in. The organization has announced that the KEA DCET Second/Final round allotment result/real allotment result is scheduled to declare on 20th September, after 11AM. All the hopefuls competed for the Karnataka DCET and waiting for the first round allotment results can visit the official portal and check the details. Candidates allotted admission in 2nd round can download the seat allotment order to report at the allotted college. Candidates who do not get the admission in the first round (real allotment) can wait for the Option Entry Schedule – Second and Final Round, which is going to be declared on 20th September. More details regarding the Karnataka DCET Diploma admissions have provided here for the reference of aspirants. The KEA has organized the Diploma Common Entrance Test (DCET) Examination in Karnataka state from 18th April to 20th April in many examination centers. With DCET entrance test, qualified aspirants will get admission into B.E/B. Tech courses and 1st year/ 1st-semester Architecture course under Lateral Entry Scheme. A large number of seeking admission in Engineering and Architecture courses have appeared for the examination. The KEA has done with the counseling process for all ranks from 30th August to 5th September. Candidates who cleared the examination with required marks have appeared for the counseling round during the days. The admission process for the qualified aspirants will be done through the 1st round and 2nd round seat allotment processes. Candidates who have qualified in the Karnataka Diploma Common Entrance Test can check further details from the following. After completing the counseling and document verification process, the KEA had announced the mock seat allotment results. Candidates have checked with the mock allotment result and waiting for 2nd round allotment result. Hopefuls can now check the Karnataka DCET Real allotment result 2018 today, 12th Sep on KEA website, kea.kar.nic.in. Candidates allotted admission in 1st round can lock/alter their choices from 11th to 12th September. And candidates have to pay the requisite admission fee through online from 11th September to 14th September after confirming the seat. Fee paid candidates have to report at the allotted colleges on or before 14th September 5 PM along with all needed documents. Take a printout of the allotment order to report at the allotted college. These KEA USELESS FELLOWS and WORST FELLOWS when will they released 2nd round dcet seat allotment? We have paid Dcet fees but not taken the admission order in the given date now links are the closed so please tell us the solution..
Lateral entry students life halagihoitu….. Swalpanu naachike ediya nimage.. 1St internal already close.. Naav nam 3Rd sem exam na hege phase madodu heli….